After sharp year-on-year increases in 2008 and 2009, the number of corporate insolvencies has steadily decreased every year since. 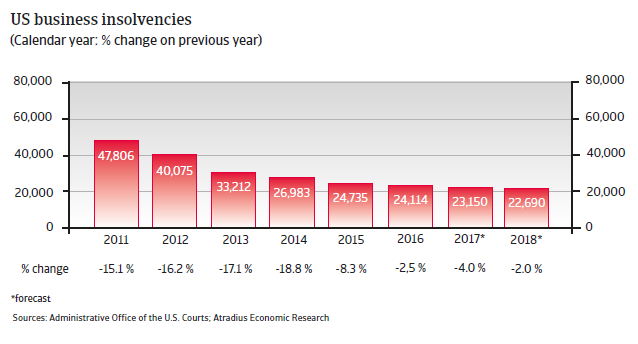 According to figures provided by the US Courts, the number of business bankruptcies filed in Federal Courts declined 2.5% year-on-year in 2016, to 24,114 cases, and preliminary numbers indicate a 4% decrease in 2017, due to the robust economic environment. 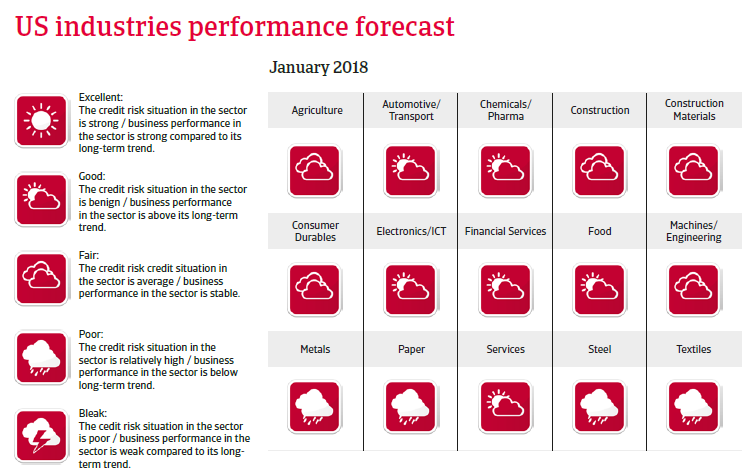 In 2018 a more modest 2% decrease in failures is forecast, but uncertainty weighs on this insolvency outlook. NAFTA renegotiations for example could have severe implications for the US business outlook through lower investment in case of heightened uncertainty or business impediments. At the same time a faster-than-expected monetary tightening path could also strain businesses’ balance sheets. After expanding just 1.5% in 2016 economic growth increased 2.2% in 2017, mainly driven by buoyant private consumption, but also by a recovery in exports thanks to stronger external demand, while investments rose again due to the modest recovery in energy prices. 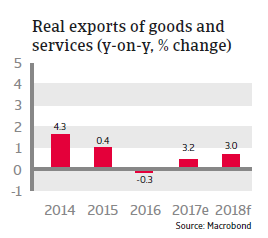 The rebound in exports and investments resulted in a more broad-based economic expansion than in 2016. Exports, investment and private consumption are forecast to continue to grow in 2018, supported by a recently approved comprehensive tax reform. Therefore economic growth is forecast to accelerate to 2.5% or even higher in 2018. Household consumption accounts for almost 70% of US GDP and has been the most important engine of growth since 2014, fuelled by a decreasing jobless rate, higher home prices a buoyant stock market and lower household saving. 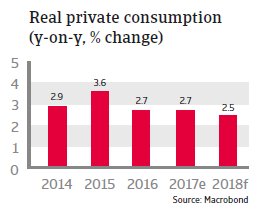 Private consumption, forecast to increase 2.5% in 2018, is expected to support US economic growth, aided by moderate real wage growth, further decreasing unemployment, access to cheap consumer credit and tax cuts. As most mortgages have fixed interest rates homeowners are shielded from higher interest rates. 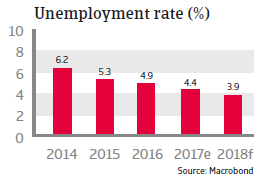 Unemployment has decreased from 7.4% in 2013 to 4.4% in 2017, and is expected to decline below 4% in 2018, which provides an important factor for rising consumer confidence and spending. Job security has increased further and real wages are expected to increase, albeit modestly. As the USD exchange rate has weakened in 2017 compared to 2016, mainly due to increased political uncertainty and a stronger euro, exports have recovered again after a contraction in 2016, and are expected to grow further in 2018 (up 3.0%). 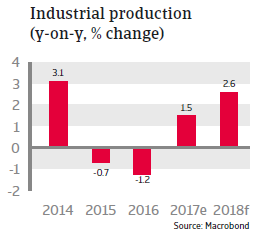 After cheaper imports due to a strong USD exchange rate crowded out some domestic producers in 2015 and 2016 and led to decreasing business profits in some industries, the manufacturing sector has seen some rebound last year, with industrial production growing 1.5%. 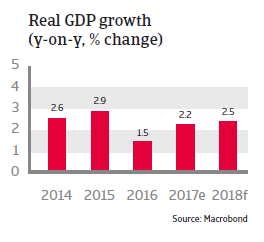 In 2018 this growth is forecast to accelerate to 2.6%. In 2016 business investment remained subdued as the US energy sector adjusted to low oil prices, while government spending and private inventories were also low. 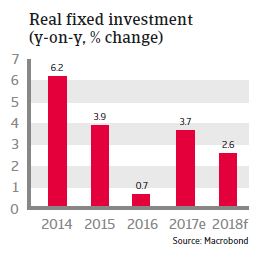 That said, due to higher prices for oil and gas, energy sector investments have rebounded as rigs were re-opened, while investments in other sectors have also recovered. Capital expenditure by businesses is expected to increase further in 2018, helped by the recently approved tax reforms. In December 2017 a comprehensive tax overhaul that had been initiated by the current US administration was approved by Congress. The bill includes a decrease in the corporate tax rate from 35% to 21% and an array of temporary tax breaks for businesses and for individuals. It is expected that corporate earnings will increase in 2018, and that US businesses with relatively high tax rates and mainly US-based revenues will gain the most from the bill. The tax relief is expected to amount to about USD 1.5 trillion over the coming 10 years, however details on how it will be financed without straining public finances have not yet been provided. The US Federal Reserve has cautiously increased the interest rate since the end of 2016, with the latest target range for the federal funds rate rising 0.25% to 1.25%-1.5% during its December 2017 meeting. This increase was justified with the ongoing robust development of the US labour market and solid economic expansion expected in 2018. The Federal Reserve is expected to continue its gradual monetary tightening process in 2018 (three additional rate hikes in 2018 were announced), not posing a significant drag on economic growth. 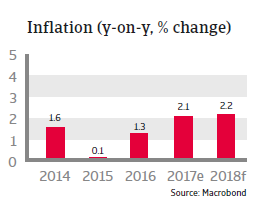 Inflation is expected to increase moderately in 2018, by 2.2%, leaving the US Federal Reserve with some leeway in its monetary policy. Further gradual tightening in 2018 and beyond is important to create the monetary tools necessary to stabilise the US economy in case of future economic downturns. Concerns about a surge in US-initiated protectionism have receded somewhat. Thus far, policymaking has not been too radical, as stepping out of the planned TPP and scrapping TTIP negotiations were largely expected and do not change current trade regimes. However, the US administration´s trade policy remains a downside risk, not just for trading partners, but also for the US economy itself. 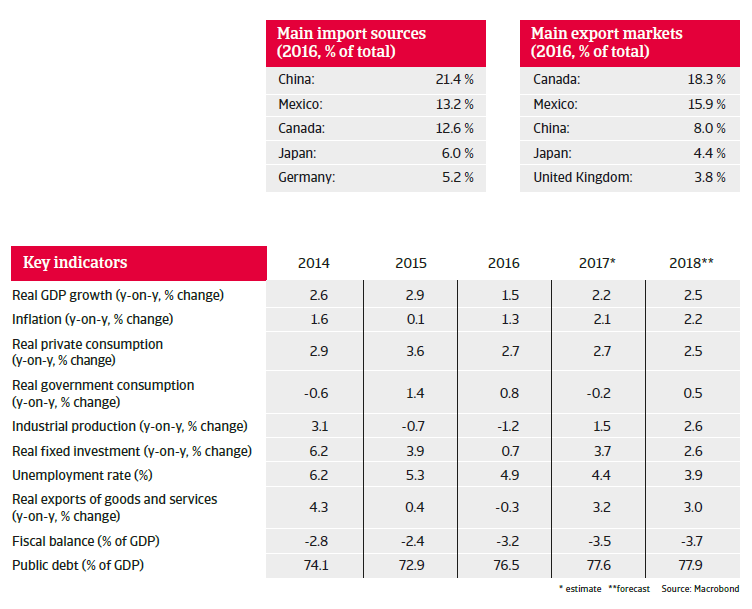 Given the dependence of some large segments of US businesses on supply chains with Mexico a failure of the ongoing NAFTA renegotiations and a US pull-out from NAFTA could severely affect certain industries (e.g. automotive). While in general insolvencies are not expected to rise sharply, an increase in business failures in Puerto Rico and the Houston area cannot be ruled out. After a minor increase from 47.6% in 2015 to 48.4% in 2016, the percentage of overdue B2B invoices appears to be flattening out, rising to 48.8% in 2017.